Low cost interventions on the farm like soil testing, on-farm ponds and mechanized sowing can significantly increase crop yield in the tropical drylands, suggests a recently published study. The research paper ‘Low-cost interventions for big impacts in dryland production system’ describes impediments to realizing higher yields in Kurnool and Anantapur districts of Andhra Pradesh, India. Depleted soils, dry periods during the crop growing phase and absence of mechanization were targeted by the researchers to improve yield. “Small investments and policy support in system-context technologies can substantially improve productivity and livelihoods of a large number of smallholders in drylands, while contributing to resilience against climatic variability,” the researchers stated in the Archives of Agronomy and Soil Science. For the study, the research team including ICRISAT scientists Dr Girish Chander, Dr Shalander Kumar, Dr Komuravelly Srinivas and former Director of RP-Asia Dr Suhas P Wani, analyzed over 120 soil samples from two villages in each of the districts in 2015. They found low organic carbon content in 78% of the fields studied. It was found that secondary nutrient deficiency including that of sulfur (93% deficiency), micronutrients zinc (84 % deficiency) and boron (73% deficiency) also contributed to poor yields of groundnut, legumes and millets. The deficiencies resulted from crop intensification in the recent past sans addition of secondary or micronutrients; such addition is uncommon in the region the researchers observed. To improve soil fertility, these deficienct nutrients were added and the resulting crops from the farms were compared with those from farms where no such additions were made. The researchers found that addition of macro- and micronutrients increased grain production by 30%. Economic analysis revealed the additional net returns were over seven times the cost of applying secondary nutrients and micronutrients to the soil. Similarly, a 30% increase in crop yield was realized following drought-proofing with on-farm ponds. To keep costs low, these ponds were cement-lined without use of stone, brick or sophisticated masonry. Water augmentation further helped farmers grow high-value market crops like vegetables and fruits. The scientists also identified absence of mechanization as a limiting factor in improving crop yield. During the study period, sowing machinery was provided through a common hiring center. 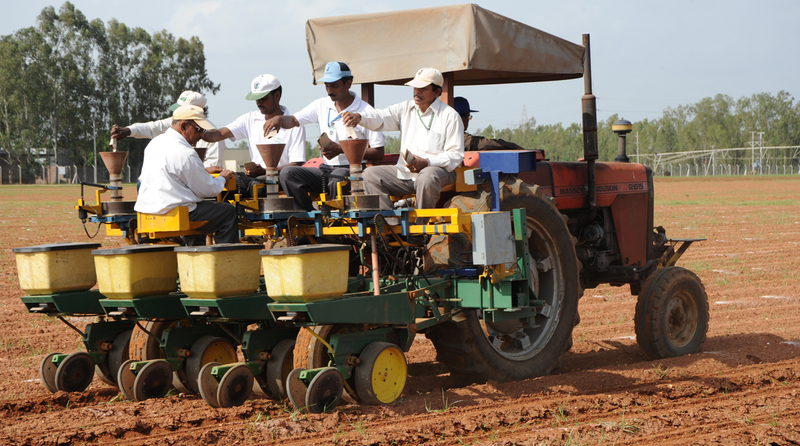 They established that mechanized sowing reduced input cost and increased pod yield of groundnut by as much as 12%. “Desired policies to promote such low-cost but critical interventions are needed to benefit large numbers of smallholding farms that may increase their abilities to put their farms on the growth trajectory,” the authors of the study noted while calling for policy-mediated farm interventions.